John Riley reviews the new 80mm macro for Fujifilm X-Mount cameras, with 1:1 macro, optical image stabilisation, and weather sealing. Macro lenses slightly longer than the standard for a format have always been popular, largely for the increased working distance that enables the subject to receive better lighting, without the lens getting in the way. As such, in 35mm format terms, the 100mm lens has reached almost universal acceptance as the best compromise. Fuji now has a new macro lens for their APS-C format X series cameras, an 80mm f/2.8. This has a “35mm format equivalent” of 120mm (actually 122mm), which is relatively unusual. There have been 120mm lenses in the days of manual focus film SLRs, but not for many years. So here we have the new Fujinon 80mm f/2.8 Macro, let's put it to the test using the Fujifilm X-T2 body provided for this review. First impression is of a chunky, well-made lens that weighs in at a fairly hefty 750g. Lifting and examining the optic we are treated to a quite dramatic clunking sound from within, clearly something connected to the OIS system. If we place the lens down again close to any ferrous metal objects, provided they are quite small they will promptly attach themselves to the lens barrel. Hair grips do this quite effectively, indicating that the lens has quite a strong magnetic field. This was confirmed using a compass, which reacts to the lens from a few centimetres away. The expectation is that such strong magnets could lead to an impressive OIS performance. Our tour of the lens starts at the generously sized round lens hood. It bayonets cleanly and precisely into place and is very unlikely to come adrift accidentally. Within the bayonet fitting for the lenshood is a 62mm filter thread. The front element has been given a fluorine coating to repel dust, dirt and moisture. The rest of the lens elements are coated with Fuji's EBC (Electron Beam Coating) to suppress flare and improve contrast. Moving towards the camera body we find the wide electronic focusing ring. This remains active during AF, enabling fine tweaks to be made, especially useful for macro photography. Focusing is down to 0.25m, a maximum magnification of 1.0x, 1:1 or life-size. Next up is the generously sized aperture control ring. There is an A setting that enables apertures to be set by the camera body, or the ring can be used to set values with one-third of a stop detents. The ring is quite firm in operation but very smooth and the click stops are definite but verging on being slightly too indistinct. In practice, the aperture ring was used rather than the camera and this seemed to work well with the rest of the camera/lens ergonomics. Unfortunately, there is no distance scale, and therefore no depth of field scale either. This is particularly a pity with a macro lens. Closest to the camera body are two switches. The first is the OIS (Optical Image Stabilisation) on/off. The second is the focus limiter, which gives three options, full, 0.5m – infinity and 0.25m to 0.5m. Optical construction is 16 elements in 12 groups. There are 1 Aspherical, 3 ED (Extra Low Dispersion) and 1 Super ED elements. The diaphragm has 9 blades to improve the bokeh of the lens. The whole lens is weather and dust resistant. As mentioned, longer macro lenses are very useful. We don't have to approach sensitive subjects such as insects quite so closely and room is left for lighting. If this 80mm is not long enough, the lens is compatible with Fuji's range of teleconverters. 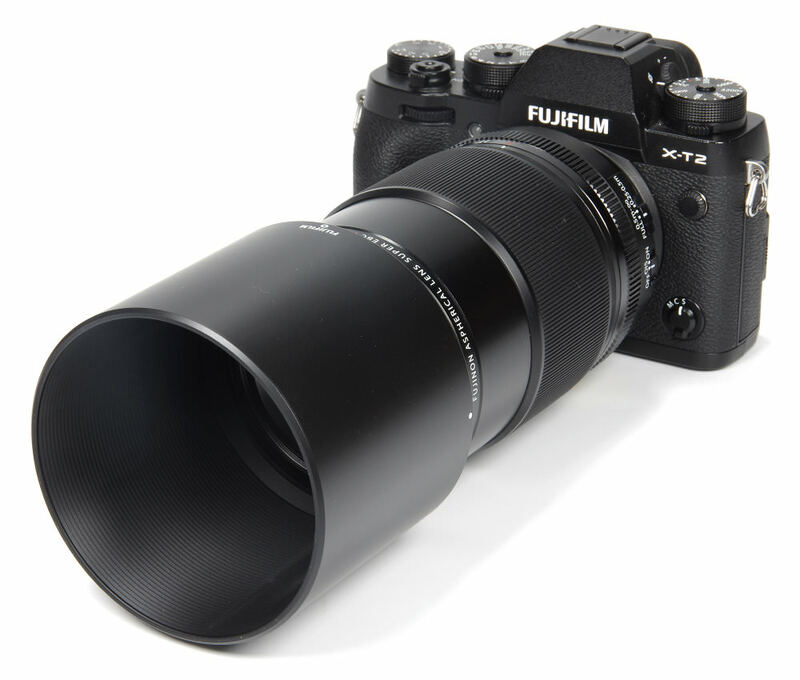 XF 1.4XTC WR gives us 112mm f/4 (35mm format equivalent 171mm f/4). XF 2XTC WR gives us 160mm f/5.6 (35mm format equivalent 244mm f/5.6). The lens is fantastic to use, having fast, responsive AF and a great feel to the controls. The layout balances perfectly with the camera body. Looking at central sharpness first, we find the results are excellent at f/2.8, becoming outstanding at f/4 and maintain an excellent level from f/5.6 to f/16. Sharpness is still very good at f/22. Edge sharpness follows an identical pattern, excellent at f/2.8, outstanding at f/4, excellent from f/5.6 to f/16 and very good at f/22. Figures throughout are very close to the centre values, showing excellent edge to edge consistency. For this review, the lens was tested on a Fujifilm X-T2 using Imatest. CA (Chromatic Aberration) is all but banished at the centre, and the edges are not far behind. Even though further correction could be achieved in software, it seems unlikely that it would be needed. The lens is rectilinear. It is possible to measure +0.01% pincushion distortion, but that is quibbling in the extreme. Flare control is absolute as well, there being no circumstances that could be found where it became a problem. The internal baffling, coatings and general design do an excellent job and contrast is well maintained in the most severe lighting conditions. The bokeh of the lens, the quality of the out of focus areas, is beautiful. This makes it an ideal portrait lens, and one that can approach closely enough for really tight headshots. Fuji claims a 5 stop advantage for their OIS system and tests indicate that this is realistic. Razor sharp images could be achieved at ridiculously low shutter speeds. However, for precise framing and some static subjects, switching the OIS off and using a tripod is still a useful technique. It is also true that OIS will do nothing for subject movement, such as wildlife. 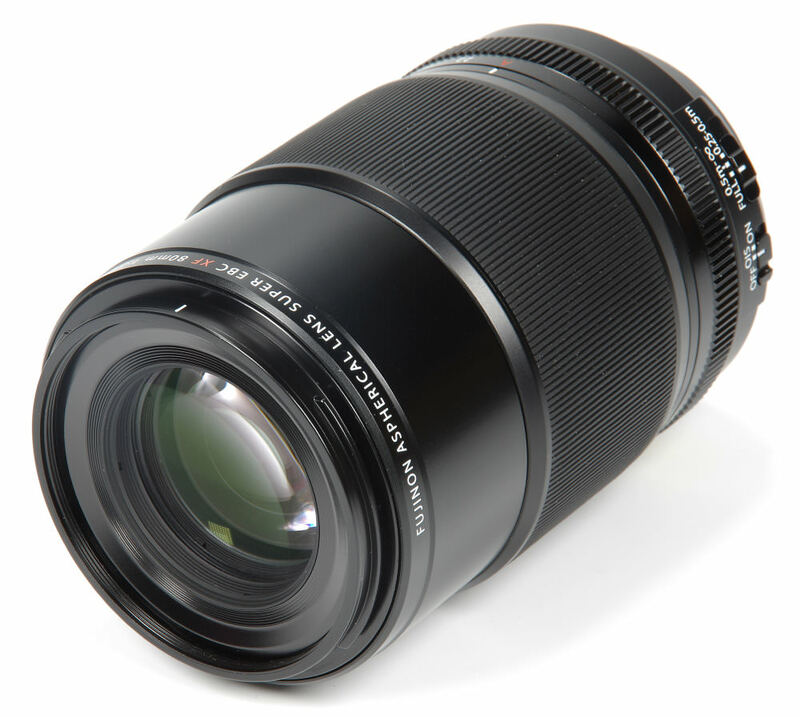 The Fujinon XF 80mm f/2.8 Macro lens is priced at £1249. It may well be that its quality of construction and performance dictate such a high price, but let's look at the rest of the market and see what lenses might do similar jobs. Within the Fuji X range, there is also the 60mm f/2.4R Macro at £579. Looking at APS-C format lenses, there are only a couple of lenses that specifically offer only this coverage. For more options have a look at the Top 10 Best Fujifilm Lenses, or the Top 13 Best Macro Lenses. 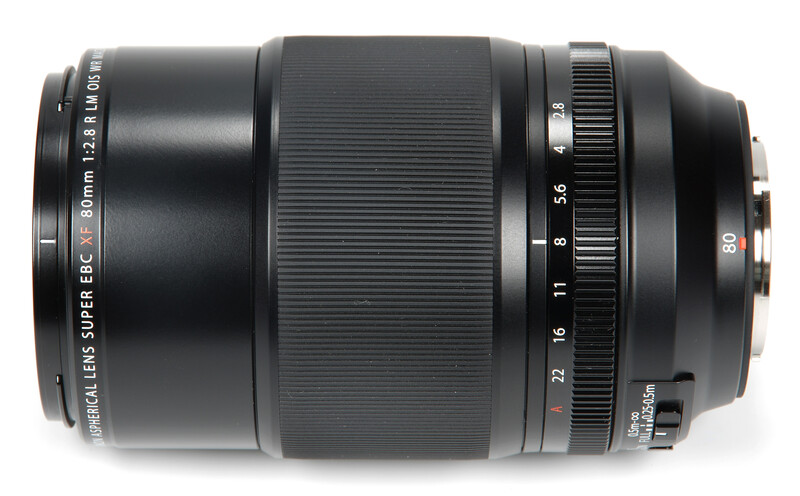 The Fujinon XF 80mm f/2.8 R LM OIS WR Macro is an outstanding macro lens, albeit it at a very high price. In another current review you compare an MfT 200mm f2.8 lens with [35mm equivalent] 400mm f2.8. Here you're actually comparing this lens with others which can be used with larger sensors, but with even shorter focal lengths. Isn't that a bit inconsistent? I'd argue if you wanted an even equivalence, you'd need to compare the reviewd optic with a 180mm f4.5 lens, although aside from the fact there aren't any, I'm sure they'd be unlikely to challenge the Fujinon for sharpness. Nevertheless, as you point out, you're laying out an awful lot of cash for this lens making it poor value. Just like that Panasonic 200 f2.8 - but it seems any tube with a bit of glass either end only gets the odd fraction knocked off even if it costs more than its weight in gold. In another current review you compare an MfT 200mm f2.8 lens with [35mm equivalent] 400mm f2.8. Here you're actually comparing this lens with others which can be used with larger sensors, but with even shorter focal lengths. Isn't that a bit inconsistent? I'd argue if you wanted an even equivalence, you'd need to compare the reviewd optic with a 180mm f4.5 lens, although aside from the fact there aren't any, I'm sure they'd be unlikely to challenge the Fujinon for sharpness. Nevertheless, as you point out, you're laying out an awful lot of cash for this lens making it poor value. Just like that Panasonic 200 f2.8 - but it seems any tube with a bit of glass either end only gets the odd fraction knocked off even if it costs more than its weight in gold. I understand the point you're making, but value is something that includes price and is not price to the exclusion of all other factors. It is true that some will just buy on price alone, but there is an element of we get what we pay for, so cheap will always be cheap and may not do the job as well. The VFM assessments take into account price, quality, what the alternatives might be, basically what the lens will do for us and how alternatives could provide something similar. Or not as the case may be. This lens makes its case on quality grounds, but unfortunately most macro lenses are arguably rather good anyway, hence the VFM part of the equation pulling the overall score downwards slightly. However, it still remains HIghly Recommended as it is still within that band of assessment. Given time perhaps the price will fall, in which case the equation changes slightly again. I think it's well understood generally why the 200mm lens was compared with a 400mm, but that's something for the other review. In this case, the 120mm-equivalent macro lens is fairly close to a 100mm macro on a full frame camera. In terms of ease of use and rough working distances much more similar than a 180mm would be, which is a different beast altogether. I understand the point you're making, but value is something that includes price and is not price to the exclusion of all other factors. It is true that some will just buy on price alone, but there is an element of we get what we pay for, so cheap will always be cheap and may not do the job as well. The VFM assessments take into account price, quality, what the alternatives might be, basically what the lens will do for us and how alternatives could provide something similar. Or not as the case may be. This lens makes its case on quality grounds, but unfortunately most macro lenses are arguably rather good anyway, hence the VFM part of the equation pulling the overall score downwards slightly. However, it still remains HIghly Recommended as it is still within that band of assessment. Given time perhaps the price will fall, in which case the equation changes slightly again. I think it's well understood generally why the 200mm lens was compared with a 400mm, but that's something for the other review. In this case, the 120mm-equivalent macro lens is fairly close to a 100mm macro on a full frame camera. In terms of ease of use and rough working distances much more similar than a 180mm would be, which is a different beast altogether. Sorry John I confused this with a 120 (another review I’ve read very recently) so this is more like a 150 on 35mm equivalent terms. However, although some of the attributes of an f2.8 hold (like expected sharpness and focussing speed at wider apertures), if you’re going to equivalence focal length, it makes equal sense to equivalence aperture since total light gathering does have a commensurate value. Here we have a lens that can only be used with Fuji cameras, so in that sense it’s similar to MfT optics - they’re constrained not just by imaging circle, but by mount. The same is not tru the other way- via adapters you can use lenses designed for the 35mm imaging circle (and others - I have a 50-200 four thirds lens for example). You do lose the convenience of fast autofocus, but that often is not a shortcoming (or indeed shortcut) on many of these lenses. Their optical performance is also often similar to native glass. But there’s not a fair difference in price- it’s incomparable and it seems unlikely to be accountable to manufacturing cost. Some people will of course take a ‘money no object’ approach to their purchases. My argument is that when a lens costs 2-300% more than it potentially might, that’s a bit more than one star off the vfm rating. I really don’t think this is an extreme perspective. I don’t of course have to buy lenses such as these, but if manufacturers can get away with charging huge mark-ups, the trend for future releases is fairly bleak. Perhaps the ILC is becoming more of a niche product - this sort of pricing strategy will ensure that future- it will potentially kill of the MfT format altogether. I don’t want that. Sorry John I confused this with a 120 (another review I’ve read very recently) so this is more like a 150 on 35mm equivalent terms. However, although some of the attributes of an f2.8 hold (like expected sharpness and focussing speed at wider apertures), if you’re going to equivalence focal length, it makes equal sense to equivalence aperture since total light gathering does have a commensurate value. Here we have a lens that can only be used with Fuji cameras, so in that sense it’s similar to MfT optics - they’re constrained not just by imaging circle, but by mount. The same is not tru the other way- via adapters you can use lenses designed for the 35mm imaging circle (and others - I have a 50-200 four thirds lens for example). You do lose the convenience of fast autofocus, but that often is not a shortcoming (or indeed shortcut) on many of these lenses. Their optical performance is also often similar to native glass. But there’s not a fair difference in price- it’s incomparable and it seems unlikely to be accountable to manufacturing cost. Some people will of course take a ‘money no object’ approach to their purchases. My argument is that when a lens costs 2-300% more than it potentially might, that’s a bit more than one star off the vfm rating. I really don’t think this is an extreme perspective. I don’t of course have to buy lenses such as these, but if manufacturers can get away with charging huge mark-ups, the trend for future releases is fairly bleak. Perhaps the ILC is becoming more of a niche product - this sort of pricing strategy will ensure that future- it will potentially kill of the MfT format altogether. I don’t want that. Surely the purpose of using a macro lens capable of 1:1 is close work, an area not covered by most lenses. The Fuji 60mm lens does not actually do 1:1 without extension tubes. The review has just one picture at the closest focus point, the majority of photographs shown could be taken by any lens. As a forensic photographer for many years a great deal of my work was 1:1, fingerprints, document examination, injuries, ballistics, striations etc. Nowadays it’s 1:1 of lichens, tiny fungi, insects, plant sections etc. This review was totally inadequate for a review of a macro lens. Surely the purpose of using a macro lens capable of 1:1 is close work, an area not covered by most lenses. The Fuji 60mm lens does not actually do 1:1 without extension tubes. The review has just one picture at the closest focus point, the majority of photographs shown could be taken by any lens. As a forensic photographer for many years a great deal of my work was 1:1, fingerprints, document examination, injuries, ballistics, striations etc. Nowadays it’s 1:1 of lichens, tiny fungi, insects, plant sections etc. This review was totally inadequate for a review of a macro lens. [quote]This review was totally inadequate for a review of a macro lens. [/quote] I agree your point :D This aside most reviews are similarly totally inadequate. This is no good reason why, once again, ephotozine should produce a review which is totally inadequate for potential buyers of a lens, or for that matter some camera body reviews. 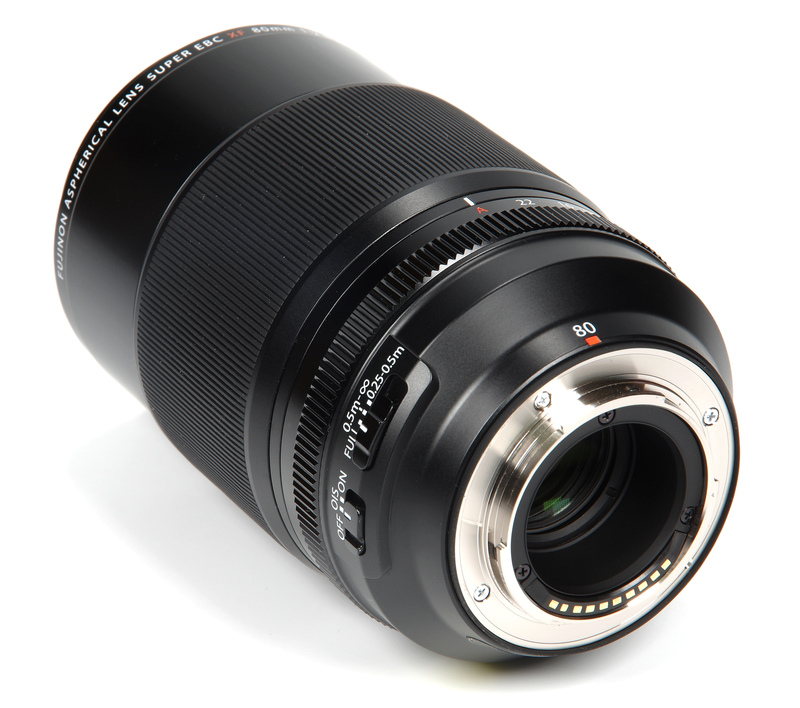 Quote:This review was totally inadequate for a review of a macro lens. This aside most reviews are similarly totally inadequate. 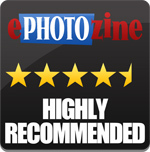 This is no good reason why, once again, ephotozine should produce a review which is totally inadequate for potential buyers of a lens, or for that matter some camera body reviews. [quote]The review has just one picture at the closest focus point, the majority of photographs shown could be taken by any lens. [/quote] We have added a number of additional images. Quote:The review has just one picture at the closest focus point, the majority of photographs shown could be taken by any lens. We have added a number of additional images. [quote] We have added a number of additional images. [/quote] Well sort of :( The only image with the subject reasonably parallel to the sensor is of a postage stamp - not exactly the highest resolution subject for 1:1 photography. At 1:1 focus (which the specification implies the lens does) at f8, presuming the lens does not change angle of view, depth of field is unlikely to be more than about 1mm in front of and 1mm behind the focus point.. Other important to macro photographers issues include 1/ does the lens shorten effective focal length significantly and widen the effective aperture (as many AF macros do) by 1:1 focus and if so by how much? 2/ Does the image stabilisation loose efficiency by minimum focus? If so by how much? Reviews that do not go into this level of macro performance for a macro lens, as has already been mentioned, seem "totally inadequate" especially bearing in mind that the price point restricts likely buyers to almost exclusively specialist macro photographers. The only image with the subject reasonably parallel to the sensor is of a postage stamp - not exactly the highest resolution subject for 1:1 photography. At 1:1 focus (which the specification implies the lens does) at f8, presuming the lens does not change angle of view, depth of field is unlikely to be more than about 1mm in front of and 1mm behind the focus point..
1/ does the lens shorten effective focal length significantly and widen the effective aperture (as many AF macros do) by 1:1 focus and if so by how much? 2/ Does the image stabilisation loose efficiency by minimum focus? If so by how much? Reviews that do not go into this level of macro performance for a macro lens, as has already been mentioned, seem "totally inadequate" especially bearing in mind that the price point restricts likely buyers to almost exclusively specialist macro photographers. I can remember a time when some USA photo magazines would include dismantling a camera as part of a test/review, thus commenting in detail on how it was made. This stopped a long time ago, whether or not because manufacturers didn't like such a degree of mistreatment of the products they loaned out or because of increasing complexity of the products I do not know. The point I'm making is that in the limited time products become available for review there has to be a limit as to how much can be included, and indeed how much people want to read about. This review tells us how well the lens performs on a variety of subjects, shows the data measured, comments on the handling and other general observations that hopefully give us the conclusion that it's excellent, albeit expensive. As regards the macro capability, it is of course so much more and can cover all the other short telephoto applications. The picture of the stamps has been included to show the field of view, which is comparable with a similar picture I have started including in the reviews. We can all relate to the size of a stamp. This also shows it is highly rectilinear and that it renders the texture very well, which indicates the high resolution. I will see about finding some other suitable subjects that are readily available for next time around with a macro lens. As regards the OIS, I'm not sure that this is very useful at macro distances anyway. I would be putting the camera firmly on a tripod, in which case OIS would be switched off. If chasing butterflies in the field, for example, OIS might still be switched off as it won't stop subject movement and any delay in it locking on would be undesirable. Having said that, if you have some application in mind in this respect do please let me know and I'll see if it can be incorporated in the future. [quote]I The point I'm making is that in the limited time products become available for review there has to be a limit as to how much can be included, and indeed how much people want to read about. [/quote] This is one point of view - that ignores anybody spending over £1,000 on a macro lens is likely to want to know its[b] MACRO[/b] capabilities along with how it optically achieves 1:1 focus. [quote] This review tells us how well the lens performs on a variety of subjects, shows the data measured, comments on the handling and other general observations that hopefully give us the conclusion that it's excellent, albeit expensive. [/quote] You again choose not to see the wood for the trees :( What is it like as a [b]MACRO[/b] lens. [quote]As regards the macro capability, it is of course so much more and can cover all the other short telephoto applications. [/quote] Why? It would only take about 15 minutes [quote] As regards the OIS, I'm not sure that this is very useful at macro distances anyway. I would be putting the camera firmly on a tripod, [/quote] Sorry - you have maybe just shot yourself in both feet and in both hands! If you do not know that one of the reasons for putting OIS in a macro is to make hand holding feasible when a tripod is not you are perhaps not very knowledgeable about the flexibility of modern macros with OIS/IS/VR, especially with a crop sensor body with more depth of field for any given magnification than 24x36. If this remains your idea of what a competent review of a [b]MACRO[/b] lens should include it is more than likely many experienced macro photographers will continue to regard your review as totally inadequate..
Quote:I The point I'm making is that in the limited time products become available for review there has to be a limit as to how much can be included, and indeed how much people want to read about. This is one point of view - that ignores anybody spending over £1,000 on a macro lens is likely to want to know its MACRO capabilities along with how it optically achieves 1:1 focus. Quote: This review tells us how well the lens performs on a variety of subjects, shows the data measured, comments on the handling and other general observations that hopefully give us the conclusion that it's excellent, albeit expensive. What is it like as a MACRO lens. Quote:As regards the macro capability, it is of course so much more and can cover all the other short telephoto applications. Sorry - you have maybe just shot yourself in both feet and in both hands! If you do not know that one of the reasons for putting OIS in a macro is to make hand holding feasible when a tripod is not you are perhaps not very knowledgeable about the flexibility of modern macros with OIS/IS/VR, especially with a crop sensor body with more depth of field for any given magnification than 24x36. If this remains your idea of what a competent review of a MACRO lens should include it is more than likely many experienced macro photographers will continue to regard your review as totally inadequate.. Thank for the review, I always find your reviews useful. I have some questions and comments: this lens on a 24MP Fuji X-T2 seems to outresolve or resolve very similarly to the Sony FE 90mm f/2.8 Macro G OSS mounted on 42MP Sony Alpha A7R II. Furthermore, it is much more planar than the above lens. I do not udnerstand then why the Sony gets a higher score than this lens. Quote:I can remember a time when some USA photo magazines would include dismantling a camera as part of a test/review, thus commenting in detail on how it was made. This stopped a long time ago, whether or not because manufacturers didn't like such a degree of mistreatment of the products they loaned out or because of increasing complexity of the products I do not know. The point I'm making is that in the limited time products become available for review there has to be a limit as to how much can be included, and indeed how much people want to read about. This review tells us how well the lens performs on a variety of subjects, shows the data measured, comments on the handling and other general observations that hopefully give us the conclusion that it's excellent, albeit expensive. When you say a higher score I'm not sure whether you mean higher resolution figures or more stars in the summary. If the former, then figures will be in a higher range for a 42MP sensor than for a 24MP one, but we can still relate the performance of a lens to its theoretical maximum. If the star ratings, these are bands of performance and, adding up the various ratings and then averaging them will give us an overall rating. Both lenses score very highly in performance and handling, both are close in terms of features offered but the Fuji does lag a little in terms of VFM. This is mainly where the Sony gets a slight advantage in being truly excellent and rather more accessible in terms of cost. They get similar resolution figures centre of the lens, but Fuji is much more planar, nothwithstanding the fact Fuji is working on a 24MP APS-C sensor and Sony is working on a 42MP FF sensor. In other words, it seems the Fuji lens is optically superior, and a clear technical winner particularly for a high magnification macro lens where resolution and planarity are important features. Yet, the final rating in terms of stars (and of Editor's Choice) is lower for the Fuji. I understand the reasoning behind the VFM, but the optical superiority, particularly for macro, seems to balance out the higher cost and make the lens deserving a higher star score. Thanks again for the very good reviews. Quote:When you say a higher score I'm not sure whether you mean higher resolution figures or more stars in the summary. If the former, then figures will be in a higher range for a 42MP sensor than for a 24MP one, but we can still relate the performance of a lens to its theoretical maximum. If the star ratings, these are bands of performance and, adding up the various ratings and then averaging them will give us an overall rating. Both lenses score very highly in performance and handling, both are close in terms of features offered but the Fuji does lag a little in terms of VFM. This is mainly where the Sony gets a slight advantage in being truly excellent and rather more accessible in terms of cost. The results I'm looking at don't yield similar figures though. I see the Sony peaking at a value of 3859 against the Fuji at 3463. This result equals excellent for the Sony and outstanding for the Fuji when related to the different sensors. However, it's much more complex than that and we also have to incorporate ideas of CA, bokeh, distortion, "look" (a soft measurement), flare and so on into our overall concept of quality. Both lenses come into the 5 star category overall for performance. Either one would give superb results. [quote]The results I'm looking at don't yield similar figures though. I see the Sony peaking at a value of 3859 against the Fuji at 3463..[/quote] All other things being equal (which they rarely are in digital) allowing [i]only[/i] for format differences the Fuji seems to perform best. 24 to 42 MP is a 75% increase in surface area and 37.5% actual increase in pixels along a long or a short dimension of the frame. Image resolution (what is being measured) is part made up from sensor resolution and part from lens resolution. If (a big if) both lenses are responsible for 50% of the image resolution as tested then 24 to 42 MP can be expected to increase image resolution by around 18%. 3463 times 118% is 4086: usefully more than 3859 recorded. It would seem the only reasonable conclusion is either to rate both systems as equal, or the Fuji as better by a modest margin. Quote:The results I'm looking at don't yield similar figures though. I see the Sony peaking at a value of 3859 against the Fuji at 3463..
All other things being equal (which they rarely are in digital) allowing only for format differences the Fuji seems to perform best. 24 to 42 MP is a 75% increase in surface area and 37.5% actual increase in pixels along a long or a short dimension of the frame. Image resolution (what is being measured) is part made up from sensor resolution and part from lens resolution. If (a big if) both lenses are responsible for 50% of the image resolution as tested then 24 to 42 MP can be expected to increase image resolution by around 18%. 3463 times 118% is 4086: usefully more than 3859 recorded. It would seem the only reasonable conclusion is either to rate both systems as equal, or the Fuji as better by a modest margin. How do you compare the MTF of this objective with the MTF of the Fujinon 90/2? They ave completely different scales!!!! The 90mm f/2 was reviewed by the previous reviewer, using a different camera body, none of which helps to make a proper comparison. What we have tried to do is to include in the text descriptions such as "outstanding", "excellent" and so on, which give us a comparison between different MP counts and also relate so far as possible to the previous reviews. There are many variables of course, but performance is being judged against the theoretical maximum for each lens/camera combination. Hope that helps!